Andrew Wright sits behind the counter at the Hempest, a hemp clothing store in downtown Burlington, and takes a long drag off what looks like an ordinary cigarette. The plastic tip glows orange as he inhales deeply. But when he exhales, all that comes out is a small puff of white, odorless vapor that dissipates immediately. If Wright were caught smoking tobacco inside this boutique, he’d probably lose his job and could be fined as much as $10,000 for violating Vermont’s workplace smoking ban. In fact, customers occasionally give him puzzled looks or angry glares before realizing he’s not actually smoking. Wright is using an electronic cigarette, or “e-cigarette.” The battery-powered device delivers a vaporized hit of flavored nicotine that many smokers describe as similar in taste and feel to tobacco cigarettes, only without the smoke, odor or — its manufacturer claims — the deadly chemicals. “I actually prefer the taste of these over real cigarettes. It’s delicious,” says Wright, 46, who smoked a pack a day for more than 30 years before taking up e-cigarettes about a month ago. Today, Wright says he’s down to five or six tobacco cigarettes a day. “I work out at the Y and ride a bike, and I can feel the difference already,” he notes. Many other current and former smokers are raving about the e-cigarette. They say it’s the first nicotine-replacement product they’ve tried that closely mimics the real deal and helped them successfully curtail or quit smoking. Sold at a fraction of the price of regular cigarettes and not subject to the double-digit sin taxes imposed on tobacco products, e-cigarettes are catching fire in the U.S. market. Since the e-cigarette was introduced to American consumers a few years ago, business in the United States has mushroomed into a $100 million industry, according to the Electronic Cigarette Association. There are now online e-cigarette forums and discussion groups where users — or “vapers,” as they call themselves — boast about how many days they’ve been off tobacco. All that buzz is welcome news to Adam Tredwell, president of Vermont Vapor Inc. of Rutland. It’s the first company in Vermont, and the second in the United States, to manufacture the nicotine liquid used in e-cigarettes. Three months ago, Vermont Vapor opened a retail shop in Castleton to augment its online sales and promote its products locally. They include e-liquid dispensers that resemble tobacco pipes, batteries that are rechargeable in a car or computer USB port, and starter kits that sell for about $65. Tredwell, 31, says he founded Vermont Vapor in June 2009 as a way to “earn some extra cash to buy coffee” while attending law school at Temple University in Philadelphia. But in its first year, Vermont Vapor did about $100,000 in sales, and Tredwell now works at the business full time with two employees. 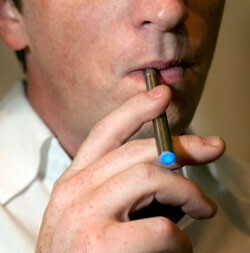 A smoker from the age of 16, Tredwell didn’t actually intend to quit when he tried his first e-cigarette. At the time, he was in the midst of his second-year law school finals — not exactly a low-stress environment for kicking the habit. Nonetheless, he claims that after “vaping” for a few weeks, he “no longer needed cigarettes” and gave them up entirely. Tredwell explains how the e-cigarette works: A cartridge at one end of a metal tube is filled with a liquid mixture of water, nicotine, glycerin, citric acid and a flavoring, such as tobacco, menthol, mint, mango or chocolate. Vermont Vapor uses pharmaceutical-grade nicotine like that found in other smoking-cessation products, such as nicotine gums, lozenges and transdermal patches. The company sources all its ingredients from vendors in the United States. As the user inhales, an atomizer, powered by a lithium battery, heats the nicotine into an inhalable vapor. This delivers a controlled dose much as a normal cigarette does, only without any combustion. That’s why e-cigarette manufacturers and proponents contend that using one isn’t “smoking” and shouldn’t be subject to indoor smoking bans. It’s that last claim that really burns many public health officials and antitobacco advocates. They express concern that consumers may assume e-cigarettes have been proven safe and effective as smoking-cessation devices. Worse, they fear that nontobacco users, particularly children and teens, will see them as risk-free tobacco alternatives. Sheri Lynn is chief of the Tobacco Control Program at the Vermont Department of Health. She says much is still unknown about e-cigarettes, including which chemicals they contain and what happens once they’re volatized. According to Lynn, the FDA has done some preliminary testing of imported e-cigarette products and found they held carcinogens, including one typically found in antifreeze. Lynn also points out that e-cigarettes still contain nicotine, a highly addictive stimulant that increases blood pressure, breathing and heart rate. Symptoms of nicotine poisoning include vomiting, diarrhea, abdominal cramping, convulsions, tachycardia and hypertension. Moreover, she says, because e-cigarettes are easy to use and are often flavored with substances appealing to children, they pose a greater risk for abuse and accidental poisoning. Meanwhile, nearly all the large antismoking organizations, including the American Lung Association, the American Heart Association, the American Cancer Society and the Campaign for Tobacco-Free Kids, have come out against e-cigarettes. These groups have called on the FDA to use its new regulatory authority over tobacco to remove them from the marketplace. For a time, the FDA tried to do just that, seizing the imported devices at the border. But in January, after two e-cigarette distributors filed suit against the feds, a federal district court judge in Washington, D.C., ordered the FDA to stop blocking their importation. The judge also suggested that e-cigarettes be regulated as tobacco products rather than as medical or drug devices. Yet, even before the FDA has determined the risks and benefits of e-cigarettes, some states and municipalities are already moving ahead to restrict their use or ban them altogether. New Jersey and Suffolk County, N.Y., have prohibited them from no-smoking areas. In late April, the New York State Assembly voted overwhelmingly to ban e-cigarettes, following the lead of Australia, Brazil, Canada, Israel, Mexico and New Zealand. On the flip side of the coin, Virginia’s attorney general issued an opinion that e-cigarette use is not “smoking” and shouldn’t be banned from no-smoking areas. Thus far, Vermont has been largely silent on the issue; no e-cigarette legislation has been proposed here. However, Sarah London of the Vermont attorney general’s office says she considers them “drug-delivery devices” that fall under the purview of the federal Food, Drug and Cosmetic Act, and hence doesn’t believe they can be sold legally in Vermont without FDA approval. That said, London adds that her office will not take legal action against Vermont Vapor or other e-cigarette dealers pending the outcome of the federal lawsuit, in which a ruling is expected by year’s end. Faced with the ever-growing drumbeat of public health condemnations and government restrictions, Tredwell of Vermont Vapor isn’t as worried as one might expect that his fledging business is about to be snuffed out. He and other e-cigarette users have found an unlikely ally in the war of words over e-cigarettes: a veteran public health advocate and antismoking crusader who once helped bring the tobacco industry to its knees. Dr. Michael Siegel is associate chairman of community health sciences at Boston University’s School of Public Health. A physician who spent two years with the Centers for Disease Control and Prevention’s Office on Smoking and Health, Siegel has done considerable research on tobacco control, secondhand smoke and the effects of tobacco marketing on children and teens. Notably, Siegel served as an expert witness for the plaintiffs in seven major lawsuits against the tobacco industry, including the landmark Engle case, which led to the $145 billion verdict against Big Tobacco. Given Siegel’s antismoking credentials, his stance on e-cigarettes may surprise some. But it’s clear from his blog, which he updates frequently, called The Rest of the Story: Tobacco News Analysis and Commentary. For months, much of that analysis and commentary has been devoted to criticizing the FDA and antismoking groups for what Siegel calls a lack of “scientific, evidence-based policymaking” regarding this promising new product. Siegel says he’s “baffled” by the response of antismoking groups to e-cigarettes. He claims much of the information they’re disseminating reflects inadvertent or deliberate ignorance of research showing e-cigarettes are much safer than tobacco cigarettes. Specifically, Siegel contends that the oft-cited claim about e-cigarettes that “we have no idea what’s in them” is refuted by at least 12 different studies that used mass spectrometry and gas chromatography to analyze the product’s chemical components. Why the official opposition to e-cigarettes? Siegel can’t say for sure, but he offers two theories. First, he suggests, antismoking groups are ideologically opposed to the idea of smokers “going through the motions of what ostensibly looks like smoking”: the long, slim delivery device, the glowing tip and the puff of white vapor the user exhales. More importantly, Siegel points out that many antismoking organizations receive significant funding from the pharmaceutical firms that sell nicotine-replacement products. “In any other setting, if you tried to sell a product that works 6 percent of the time, people would laugh you out of the market, and attorneys general would be investigating what kind of scam you’re operating,” he says. While no researcher has yet studied the effectiveness of e-cigarettes in helping smokers quit, Siegel notes anecdotally that people are reporting huge success. While he says he understands the reluctance of government agencies to label e-cigarettes “safer than cigarettes” — he himself never calls them “safe” — Siegel adds that it’s a terrible idea to rush to judgment and ban them before all the facts are in. A 66-year-old e-cigarette enthusiast in Burlington, who smoked a pack a day starting when he was 12 and now suffers from emphysema, echoes that assessment. How do antismoking groups respond to Siegel’s attacks? Almost universally, they don’t. The national director of media relations for the American Cancer Society in Atlanta declines to comment on Siegel or his criticisms. Likewise, Erika Sward, director of national advocacy for the American Lung Association in Washington, D.C., the nation’s oldest antismoking group, chuckles at the mention of Siegel’s name. “If someone wants to comment on him, we’ll get back to you,” she tells Seven Days. No one has. But apparently, Siegel is no longer the lone dissenting voice among public health professionals. In April, the American Association of Public Health Physicians issued a statement recommending that states ban the sale of e-cigarettes to minors but permit adults to buy them. Rebecca Ryan of the American Lung Association’s Vermont chapter says she hasn’t heard of Siegel but reiterates the opinion of her national organization, the Vermont Department of Health and the FDA: E-cigarettes, as unregulated and untested products, should be strictly avoided. For his part, Tredwell sees e-cigarettes as a godsend — not just in his professional life but in his personal one.